The Future of Health Care Conference brought together more than a dozen thought leaders to discuss health care reform, hospital partnerships, medical philanthropy, prescription drugs and health tech investing. The daylong conference, held June 14 at the Capital Factory and Omni Hotel, was sponsored by Bizologie, Capital Factory, Higginbotham and Medici. Sue Hart - Principal, Milliman Inc.
Health care reform debate was focused on reducing the rate of uninsured Americans (3 years before Obamacare was signed into law). Carriers could vary premiums greatly based on factors without limits: geography, age, gender, health status, group size, industry participation. Carriers could rate-up, deny coverage, or exclude preexisting conditions. Federal subsidies enabled people to buy Obamacare plans. Advance premium tax credits (APTCs) is $3 billion in TX. Cost sharing reductions $0.6 billion in TX. Individuals mandated to have minimum coverage or pay penalty. Reform proposals deal with preexisting conditions in different ways. The House passed the American Health Care Act May 4, 2017; Senate may act very soon. States can modify essential health benefits, defined actuarial values will go away. 5:1 adult age curve (greater with state waiver), no gender rating, if no continuous coverage, then 30% penalty or charged pre-existing rate if state has waiver. All states receive federal funding of Patients and State Stability Fund (PSSF) for reinsurance to lower premiums. Subsidies vary by age; very little by income (unlike ACA). In 2007, only 2-5 carriers with enrollees in individual market. Consumer experience has much improved since 2007. Can comparison shop premiums & benefits. Will it be more like 2007 or 2017? Will financing trade-offs be resolved? Will we move on to reducing health care costs? How will care delivery change? What will the role of technology be? Will enhanced data analytics lead to better and more efficient care? · Care is moving back into homes and community-based locations, such as clinics. In 15 years, a third of the population will be over 65. When Medicare started, life expectancy was 67. Now, it’s much higher. Medicaid is the #1 insurance for nursing home patients. We need to not just reform Medicare and Medicaid but embrace technology. Regardless of what Congress does, the health care industry is moving to value-based payment. Challenge: Getting the consumer to understand basic nutrition and lifestyle changes they need to be healthier. Takes just a few years for a pre-diabetic to develop diabetes. Fundamental nutrition education is important. Many generations have used the ER for primary care, especially in rural settings. Very expensive. Educate patients to be healthier so we can move forward faster. It can be done by provider, clinic, and hospital level staff. For community hospitals to stay viable, they now need to meet quality measures. There is an opportunity for hospitals to pair with employers to promote health and wellness. Employers provide health insurance, yet it’s one area where they don’t hold employees responsible for outcomes. Average prenatal care is $3,000. That can help prevent complications. Consider: The average neonatal ICU stay is $500,000. We’re going to pay for it, so how and when do we want to pay for it? Hospital pricing: Charges include cost of procedure as well as cost for quality and safety programs, equipment, indirect care staff (housekeeping, laundry), cost of providing service. They then negotiate this price with the payers. Hospitals aren’t making a lot of money off of payers. Because there are thousands of codes, it’s hard to get an itemized receipt. Data revolution will make this more transparent, so the average consumer does not have to be code-savvy. High-deductible plans have caused consumers to ask about costs and look for transparency. New telemedicine laws passed by the legislature will bring more care to rural TX. A rural ER physician can consult with a psychiatrist in Dallas to treat and manage bipolar disorder or anxiety. The originating site bills, and the psychiatrist can bill. Telemed can help alleviate the doctor shortage; average physician is 55 and still uses a fax machine. Instead of expanding Medicaid under the ACA, Texas successfully applied for an 1115 waiver for federal funds to find innovative ways to provide better care at a lower cost. Waiver still in effect and has improved behavioral health and is expanding care to rural communities. Texas may have dodged a problem because states that expanded Medicaid rely on federal funds to pay most of it. When you provide guideline-based care, you reduce discrepancies in treatment for different ages, races, genders, income. This is the best clinical care available. In the past, people went to the hospital to die; only those with money died at home. Hospitals provide inpatient acute services, but they also provide the majority of outpatient procedures. Utilization is changing due to population and our outdated model. Hospitals should evolve in how they deliver care if telemedicine and technology take away fee for service payments to hospitals. Telemedicine will play a big role in post-acute care. Medical literacy also is crucial because caregivers and families need to understand how to care for patients at home. Caregiver Act passed this session allows patients to designate a caregiver to be included in all discharge education and planning. The American Heart Association is interested in reducing death and disability from heart disease (No. 1 killer of Americans & people worldwide). Electronic medical records (EMRs) probably caused them to comply less--not more with the guidelines, and cost more, not less. We need more usable data in health care. Many patients are struggling to afford their medications. Pharmacists do not feel they should tell people to choose which meds are most important if they have limited income. People will do it on their own anyway, but they need professional guidance. Baby boomers make up half of the workforce and will retire soon. We need to be smart with technology to take care of an aging population. Respite care: Give the family caregiver a vacation for a month by pulling someone into the home to avoid institutionalizing the sick family member at a much higher cost. The foundation was created during the Depression; it created a hospital and transferred it to the State. Today, its endowment is $850M, with the money coming from private and family foundations. Annually, it gives out $35-37M for research, educating providers, clinical care, facilities, etc. Three major areas the foundation is most interested in supporting are: Cancer care, everything metabolism and the brain.Academic medical advances weren’t being offered to community because it wasn’t offered in the community health clinics. The foundation is a catalyst that brings the medical school to the community clinics. A visionary foundation board leader saw the need for a clinic. It’s doing very well—teaching prevention to patients. Also, the foundation helped fund a cancer center in Fort Worth that includes radiology, support groups, post-treatment counseling, and cooking/nutrition classes to help with prevention. A mental health initiative includes psychiatric researchers. Mental illness and depression are easier to treat when the person is diagnosed as a child, adolescent or young adult. Vital Signs 6 is being introduced to kids/adults with schools and physicians to diagnose earlier using an iPad. There is a need for real time data collection and analysis because so much information is segregated in the various silos. It’s slowing both care and advancement of technology. LIVESTRONG spends $15M a year to support cancer survivors in a wide array of programs. Since 2015, donations have been increasing 18-23% per year. Patient support is at the heart of its work. Support can be by phone or via the website and chatrooms. Some people are happy going online, others want to talk with someone. Education and awareness can be helped by technology (IBM’s Watson). They are focusing on behavior changes to keep people healthy. He encourages people to be active in the community. The foundation is working with Dell Medical School; they have six different focus groups now. He encourages people to be a part of those groups to improve health and wellness. Big technology disparity: If a patient is seen in a clinic and needs specialty care, how do they share medical records between providers electronically vs. physically picking up the record? Also, how can patients better track their own records (receipts, appointments, doctors’ orders, etc.)? Ten years ago, when he came to the foundation, it gave $9M in grants to nonprofits. Now, grants are $80M per year. Money comes from St. David’s hospitals; only about $500K are from donations. The foundation’s goal is to help the Austin metro become the healthiest region in the world. The foundation focuses on the safety net—including federally qualified health centers. Its longest standing partner is People’s Community Clinic. Patient demand is strong at all safety-net clinics. Telehealth can have a huge impact on the underserved population. We have a pretty good primary care safety net. Making sure all those clinics have integrated behavioral and mental health care is important. We’re 10 years into that. The next challenge is what happens when you have the diagnosis of cancer or heart disease? Access to specialty care is a challenge. Telehealth can be a solution. Millennials are giving to nonprofits. Those 35 and under make up 40% of the donor base. These donors respond to social media and other technologies, not direct mail. “We are shifting the conversation from health care to health. It’s focusing on the social determinants of health - work done by Robert Wood Johnson foundation,” which considers disparities in health based on where you live, what you eat, how much you exercise. The foundation’s plan for the next 3-5 years is focused on this. Three years ago, it was all about access to health care. Everyone should be involved with non-profit boards. Employees will get so much more by participating in those activities than they would from corporate-driven leadership program. St. David’s has an innovation center that encourages non-profits to work on health policy issues. Nonprofit leaders could benefit from training and coaching, but spending money on those things is frowned upon. He is trying to change the mindset so nonprofits can build capacity to benefit society. He wishes the health care industry was farther along in sharing medical records. Prescription meds make up the fastest growing part of the health care dollar, up 13% per year in the past 2 years, especially specialty drugs. Just the top 10 breakthrough drugs on the market will cost $50B in one decade. The issue is top of mind for every employer in the industry. One of the biggest complaints from pharmacists is there is no transparency from PBMs (Pharmacy Benefit Managers). PBMs have gone to tiered or percent co-pays. No one pays retail drug prices. What is lacking is transparency. The PBM gets rebates from the manufacturer. They may negotiate with the payer who gets a portion of that rebate. Medicaid requires rebates. Sounds like kickbacks, right? Yes, mandated by the federal government. Medicare Part D drug coverage, thanks to lobbying efforts, can’t negotiate prices with the PBMs. So, under Medicare, the federal government pays the highest prices fo drugs. The VA is half of that. The lack of transparency creates huge challenges for consumers and community pharmacies. Why are big pharma companies increasing their prices across the board by 20%? On the R&D side, drugs getting FDA approval have fallen from 20% to 12%. So, the R&D is costlier but failure rates also are higher. Are companies taking higher risks? There hasn’t been change in review process, but drugs are getting approved much faster. Another reason for high costs is greed, which is greatest in generic drugs. Just a few companies make the drugs, so shortages abound. Shortages worsen if one company gets shut down. There’s actually a shortage of sterile water, or sodium bicarbonate, which is needed if a person has a cardiac arrest. The price goes up but doesn’t come down when the shortage goes away. The FDA will grant between 5-7 years of exclusivity after approved. Novel formulations extend this out. Specialty drug companies are expanding, too. And those drugs can be very expensive. Aetna and Humana are negotiating for the hep C drug Sovaldi, one of the few products that is truly curative. The pharmaceutical companies priced the drug based on the lifetime savings of treating hepatitis C patients as long as they’re alive. In 2014, only 39% of Texas pharmacists worked in a CVS-type store. Only 12% owned a pharmacy shop; the rest are in hospitals. Pharmacists now work in large group care practices, mostly value-based ones where the system is at risk. Pharmacists have been uniformly trained in past 20 years. Students are trained in direct patient care and treating chronic patients, but not reimbursed except in NC, NM, CA, OR, WA. UT’s pharmacy school is partnering with Dell Medical School to have pharmacists as part of the care team. The pharmacy is now the only place to get free health advice. South Carolina found pharmacists spent 40% of their time with insurance and PBM to help the patient get reimbursed for their meds. He thinks it would be better for patients if community pharmacists were allowed to sync medication renewals so patients can get them at the same time and have an easier time complying. Only a few states allow pharmacists to prescribe to patients; Europe allows that, however. About 30-35% of the US population is functionally illiterate and needs telephone, in-clinic, and home visits to explain meds and boost adherence. Medicaid is now calling at-risk populations. Virginia Commonwealth University did a study on homeless people who were given smartphones by Medicaid to improve compliance. For Behavior Change - We have the MacGyvers and the Homer Simpsons. we tend to build for MacGyvers, not the Homer Simpsons. As a financing and marketing innovation company, when we say health, the company doesn’t think about health care, but rather health tech, health safety, health and wellness. Those are the kinds of clients they work with. They look for technologies that help patients take an active role in their care: the consumerization of health care. Start using kickstarter and indigogo. They’re useful for marketing and for those who aren’t ready to raise capital. Test a concept and see what messages resonate. Look for a consumer as an investor. Using SaaS (Software as a Service) is a data trap. You can build a business laser focused on that industry, but what does act 2 look like there? Is there a bigger, addressable market? It’s an exciting time to be a health tech entrepreneur in Texas, which has the biggest wave of these innovators. It will expand over the next decade. Those on the ground floor now will experience a growing ecosystem and will have the advantage of being in the game early. Apple is rumored to be bringing out a novel non-invasive glucose meter. So, what a great opportunity to sell to a competitor to help them keep up with Apple. B2B2C play: We talk to a variety of companies that have that model and get frustrated with first B and don’t think of the C. OK, does it help if you run a campaign to create a groundswell of interest in the C side of that business first? It’s still a challenge to raise capital in Texas, even in Austin and Dallas, versus Boston. There’s a lack of education around the opportunities. NarrativeDx was a pre-revenue company when we made an investment in it. Digital Pharmacist had some market theories they were testing and now have more validation for. In the health care arena, it really helps to know the market very well and to understand why people haven’t cracked the nut yet, how to build something proprietary, how to fit with the macro trends (like outcomes or care as it moves from a centralized hospital to the patient’s home). They’re looking for a founding team with a blend of domain and tech expertise. The financing strategy is: Let’s raise a little money to get to your first inflection point. Take the money from whoever will give it to you. Get to the early customer traction from people who buy the company and demonstrate the product’s value. Then it’s about scaling and putting more points on the board - Series A. Before that, though, is the seed money. Figure out how to raise capital from friends/family institutions. We want to see sales leadership - people who have sold into big companies. Talent needs to be imported in many instances since we can’t wait 5-7 years. We see Baylor Scott and White taking early risks in Texas to prime the pump for those kinds of things. Texas has a long history of enterprise, especially Austin, where we see lots of great enterprise software. 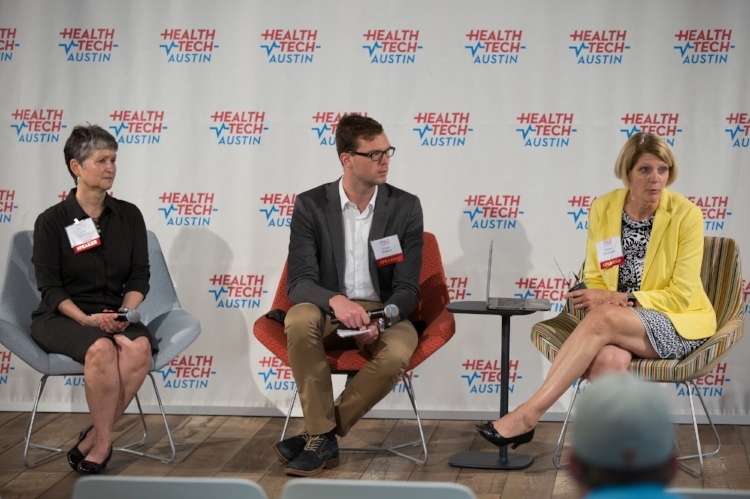 We have not seen that many ground-up consumer companies break out of Austin, but there is a lot to learn about how things work for enterprise companies, which is quite applicable to health care. Selling to hospitals is hard, but I’ve seen people make that transition from enterprise. This is something that people in Austin can crush - have talent, good first clients, good expertise available and models that can grow. So, we see a wide swath of health care IT here selling to hospitals and payers and bringing a breadth of skills to bear in this town. Half of our portfolio is a SaaS+ model. In health care, you can only get paid so much on a SaaS basis. As you crush the first act, what does act 2 look like (patient data and insights)? How do you think about monetizing in a consumer- or patient-centric fashion. You have to get to some scale before you can get to act 2. We think a lot about the act 2 for every one of our companies. We have invested in 42 companies to date, 10-week accelerator, pharma, tech-enabled services, consumer/digital goods, etc. We add value in a relatively short time and look for CEOs for first time in health care. Do as much as you can on your own, before the moment you ask a complete stranger for money. Then ask all that you can of your network. Leave the shop and knock on doors. You will learn so much. SBIRs (Small Business Innovation Research) and STTRs (Small Business Technology Transfer) are grants that further your research. Also, there are early stage regional semi-philanthropic funds. It’s OK to have fixable issues that are going to be part of achieving your next phase of growth. Follow-on rounds are $500K to $1M from our network. Where I am not on board is with a young company developing IT with that big partner when the IP is co-owned and limits your exit potential. You are tied to them as distribution and you may get a job, but that’s it. We don’t want to sell out at $1M valuation, neither do the entrepreneurs. Companies that have large strategic partners on board are helped. If they own a slice of your company as a major client, they can roll you out to 900 hospitals. But signing exclusives is essentially selling your company. On the big deductible, that’s re-educating our consumer. There is a cost to this, and consumers are starting to ask questions about that.